The Nightmares in Mary Skelter: Nightmares are the fearsome guardians of the Jail, a class of enemies that give relentless real-time chase to Jack and his party. Before you escape from prison you need to escape from Nightmares! What are you afraid of? 1. Make your own Nightmare, using any artistic medium of your choice! 2. 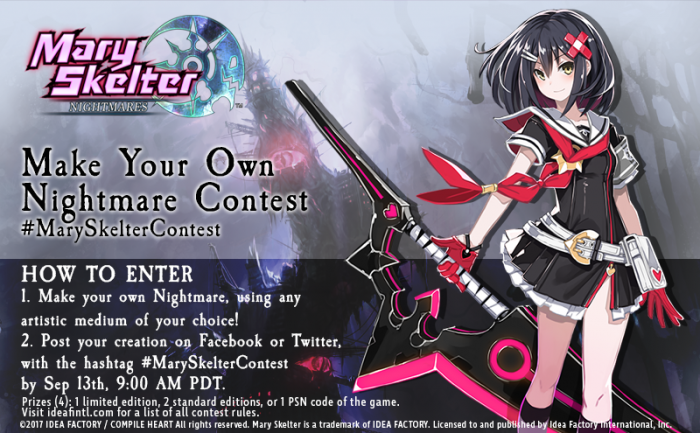 Post your creation on Facebook or Twitter, with the hashtag #MarySkelterContest by September 13th, 9:00 AM PDT. Limited to one entry per person. Posting on both Facebook and Twitter will count as one entry. 3. On September 14th, we will announce the contest winners on Twitter and Facebook! Take a look at the Nightmares (and Blood Maidens) for some inspiration, on the Iffy-cial site! Please keep entries PG-13 and appropriate. Inappropriate entries will not be posted or considered. The deadline is Wednesday, September 13, 2017 at 9:00 AM PDT. By submitting your entries, you are giving express consent for Idea Factory International to share your pictures online. Winners will be contacted in a private message to receive their prize. We will ask for your full name, your mailing address, and your email or phone number! This information will only be requested if you win the contest(s), and we will not share your information with any other companies. 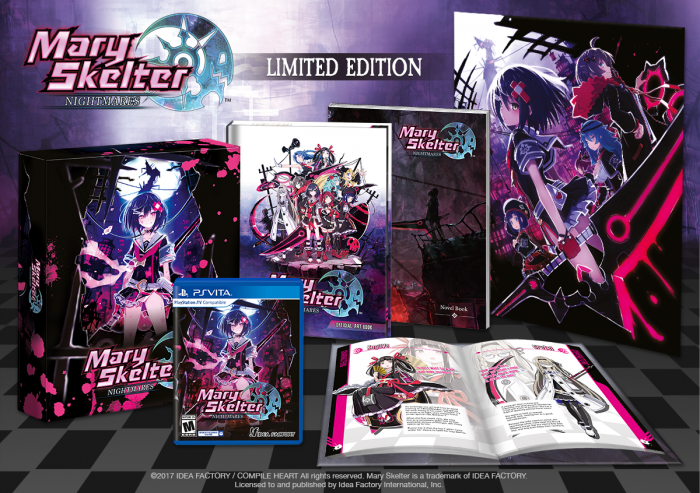 Those who win prizes can expect their items to be shipped out shortly after the release date of Mary Skelter: Nightmares. Shipping times may vary depending on your location! You must be 18 years of age or older to enter the contest. Entries are accepted from all countries worldwide. Plagiarism will not be tolerated. Plagiarized entries will be automatically disqualified. Contestants who submit plagiarized entries will also be banned from future IFI contests. This will be strictly enforced.